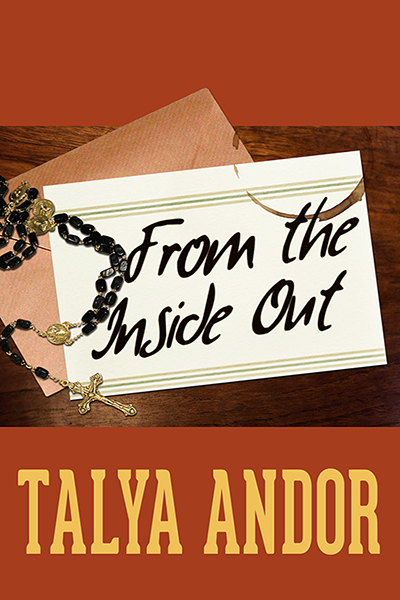 On tap this evening, I’d like to share lovely reviews I received for From the Inside Out, and a bit of info about the story as well as a short excerpt and purchase info. Diane of Hearts on Fire gave From the Inside Out a fabulous five hearts! Check out her review to see many of the lovely things that she had to say. Soren is shy and quiet; he has his job as a barista, he has his close friend Sloane and he has his school, but he breaks out of his shell one day and agrees to meet with his online friend Tru. The meeting doesn’t go as planned and Soren is left wondering just what he should do next. Lucas is a shift supervisor barista and has never really noticed Soren before, but after arranging a date with an online friend, he realises just how much Soren appeals to him. This is a wonderful finding yourself story for these two young men, both main characters discover themselves as we progress through the book, and they discover the courage to face everything head on. Soren is a character that is very quiet; he will back down or dodge when questioned head on and has made avoiding decisions an art form, when he finally gives Lucas a chance, he discovers that he has to take control of his life and to start standing up for himself. Lucas is a character that is very sure of himself; he knows what he wants and goes after it, when he does notice Soren, he discovers that he wants much more than he ever thought he would. This story is a journey of discovery for Soren and Lucas, both of them grow as the story progresses, and they face the challenges that are thrown at them. Soren is a slow developing character; he has slow progress as he comes out of his shell, but he makes huge leaps and bounds as he starts to stand up for himself and what he wants. Lucas has his own confusion to work through as he faces the inner struggle to get to grips with how he feels. Both Soren and Lucas face the turmoil of coming out to their parents and the hostility of a co-worker. I have to say that this is a very involved story, you get to know the characters very well and you become invested in them. The romance is very sweet and is drawn out throughout the book, there is no rushing in this story; it is all drawn out really well. There’s love, romance, angst, misunderstandings, a near miss with danger and some conflict, but most of all there is growth and finding the person you can be. I will recommend this story to those who want a true finding yourself story, developing love, some parental conflict and a very sweet happy ending. As an author, I’m going to say something that I believe I’m not supposed to say — I don’t think this book is necessarily for every M/M reader. This isn’t a quick read, and the characters don’t jump into bed right away. (That’s an understatement.) One of the elements I focused on when writing this was the emotions, the relationship development of the characters involved; and not only the two main guys, but the people around them to a lesser extent. It takes a while to build their relationship at a believable pace, but it’s worth it when they get there. This story is a low, slow cooker and while the peaks of the story aren’t in frenetic action or surprise twists, there is payoff for both young men, and character growth as well. I wanted to tell a story that addressed coming out, and growing up, in ways that showed how all of that intertwined with the intensity of real first love. Though it may have taken a lot of words to get there, I told the story that I wanted to. Whether that’s the story that is for you, well … I encourage you to take a look at some of the other reviews and satisfied customers on Goodreads or Amazon. The beginning isn’t so hard; it’s what comes after—that’s the challenge. Soren Wilkenson stared at the blinking cursor for a moment, and then switched over to his open session of Microsoft Word and the history paper that awaited him. He had the paper outlined, but needed more research to flesh it out. He still had a long way to go. A soft chime sounded over his speakers, recalling his attention to one of the open IM sessions in his other window. A paragraph. Finish a paragraph of the paper first. Soren knew he couldn’t wait that long; he never could. He tabbed to the other screen. Dawntreader: You know it. Can never stay on top of the stuff. TruBishounen: *laughs* Well, full time work and school will do that to you. Dawntreader: be right back, okay? Claire sat down on the edge of the bed, trying to smile reassuringly, but ending up somewhere near inquisitive. “Come on, Soren, do I need a reason to talk to my oldest son?” She was looking at his books now, the spines, reading the textbooks he had out for ostensible reference. Soren’s fingers itched. He was restless, ready to type, even if it was just to return to struggling over each sentence doled out for the non-inspiration of the history paper. He was also anxious, realizing he hadn’t muted the sound on his computer, so he was glad that his speakers weren’t chiming with more instant messages. If there were so much as a single ping, his mother would know that his online activities had nothing to do with a paper, history or otherwise. “I know, Mom,” he replied, wondering where she was going with it. “Oh … well … nothing … Still, you know Angie’s majoring in Accounting. I just want to see you settled in something that will really help you, Soren. Even Cassie, she’s only in high school, but she’s active in the school paper and plans to go into journalism …” Claire broke off and bit her lip. He shook his head. “I’ll talk to a guidance counselor again, okay? I’m already carrying a full load this semester. At least my major’s not Religious Theory anymore.” He gave her a half-smile. She had said all of this to him before, so Soren settled for a safe answer. “I know, Mom.” His feelings were all jumbled up inside. Although he knew Claire was doing what she thought was best, she never took the time to try and understand him. He preferred it that way, in the end. There were some things he wasn’t comfortable with his mother discovering, let alone trying to explain to her. His eyes flicked to his computer monitor. Soren was still shaking his head, astounded, yet not quite. “Sloane and I are not together, okay? She’s just a friend, only a co-worker, really.” He wasn’t sure why he was trying to downgrade his friendship with Sloane, but vaguely thought that if he associated her with work to his mother, she’d let the subject drop. “Or I won’t get to work on time,” Soren finished. He shrugged. “Thanks, Mom.” He waited to hear the click of the door closing before bringing up all the chat windows on his screen again. LizTheGreat: You got to go? Dawntreader: Soon, for work … kind of trying to write a paper now. Liz was a good friend of his, and there was no reason why Claire shouldn’t know he was chatting online with her … aside from the fact that she might ask if they were going out. Claire had been a little bemused over the past five years as to how he could have such pretty, nice girl friends and not want any one of them to move into a relationship closer than friendship. She’d get it eventually, just not—he hoped—any time soon. Soren opened the last chat window, the one he’d waited for. Dawntreader: Sorry it took so long. TruBishounen: S’okay, I had econ homework. Say … why don’t we meet? Soren stared at the words on the screen until he thought they might burn into his eyes. It was such a simple, offhand suggestion, but what Tru didn’t know was that Soren had made a career of avoidance. Even though they had been chatting on and off for months now, having originally met on an online community devoted to local gays/lesbians/bisexuals/whatever, they had kept their friendship online, and Soren liked it that way. They were past the heady first days where he’d been willing to stay up online all night chatting with Tru. Besides, he wasn’t … that is to say, he didn’t think he was ready to be that open with a part of himself he’d been hiding from everyone, especially his family, for so long. Tru’s IMs, and others like his, were the reason that Soren was constantly looking over his shoulder when his family entered the room. Dawntreader: Yeah … I don’t know. TruBishounen: Come on … we’re both in Portland. And I know we probably go to the same campus. Dawntreader: What makes you say that? TruBishounen: ahh … well, some of the hints you drop. Without even meaning to. Soren’s mouth quirked. He’d figured the same thing, that Tru went to his campus. It was either his, or the Portland State campus, and that was in the heart of the city, totally different territory. TruBishounen: You got quiet. That a no? The blinking cursor confronted him, and Soren tried to clear his mind and looked to Liz’s empty chat window. He had pictured meeting Tru more than once, although Tru was faceless in every scenario. He simply couldn’t project anything onto the person he’d gotten to know over the past few months. TruBishounen: Come on, let’s give it a try. But if you say no … I won’t push anymore. I’ll give up and won’t mention it again. Dawntreader: That’s nice of you. I guess. TruBishounen: Ahh, I guess I pushed my luck. It’s just that I like you. Dawntreader: What, there’s not enough guys you like to invite out? Soren hesitated, and then switched over to his history paper to contemplate the single paragraph he had just begun. It was true that he was afraid … but it was also true he’d had thoughts, more and more often, about the way to seek out a partner, someone safe—or at least meet with someone like him. He needed a friend who wasn’t a girl. He needed someone who could show him the ropes. Soren’s eyes flickered to his bottom task bar at the blinking message. Of all the guys he had met online, Tru was the one he trusted the most. Soren returned to the IM session. TruBishounen: Sorry … I guess I’m pushing too hard. Forget I said anything, okay? I didn’t mean to creep you out. Dawntreader: No, you didn’t creep me out. Soren typed with increasing confidence, although his fingers felt clumsy. Dawntreader: When would you want to meet? He moved to his other window, trying not to think too hard. He saved his history paper and gave it up for lost. He was going to have to get ready for work soon, anyhow. He closed the paper and returned to IM. TruBishounen: Well, how about tomorrow? Dawntreader: I … guess that would be okay. Sometime before noon. TruBishounen: I’m glad you said yes. Soren dismissed those negative thoughts as he shut down his computer and stood, grabbing the work clothes laid out on the bed. He’d lived so much of his life as an observer, passively shaped by the opinions of those around him. It was past time to get out and do something for a change. “So … wait, you met this guy online?” Sloane asked, bracing her hands on the cash register. Soren nodded, giving her a half-hearted shrug. He contemplated her for a moment, looking at her with the appraisal his mother had certainly given her on more than one occasion. If he were going to date just anyone, Sloane would certainly be dating material. She was sweet and perky—good qualities for working at a coffee shop—and her heart-shaped face was framed with layered, bobbed blonde hair, her hazel eyes always sparkling. The two of them had started at their Starbucks store at approximately the same time, the summer before school. Soren had transferred from a Eugene store; Sloane had been a new hire. He had helped her out a lot in the beginning, especially with her espresso bar technique, and they had struck up a friendship based on that and common interests. One of those interests happened to be boys. The door chimed, and they looked up. Lucas Daye entered the store dressed in neat khakis and a black polo shirt, his pale blond hair tied back at his nape. He had a backpack slung over his shoulder, which wasn’t surprising—Lucas usually brought homework with him to work, or clubbing clothes, or both. Soren busied himself tidying up the bar, polishing off espresso stains with a rag, before hustling to check the steamed milk. He left Sloane to answer the question and chat. Lucas gave Soren a terrible case of tongue-tied. Quite simply put, Lucas was one of the most gorgeous guys Soren had ever seen in person and up close. He was a perfect combination of a long, elegant face, strong cheekbones, a well-shaped nose, and sensuous lips. He was funny, friendly, and hot—and Soren couldn’t manage to make himself say more than one or two words to him. “Yeah, Becky is finishing up the mid-shift,” Sloane answered. Soren bent his attention to the temperature of the milk, flicking his braid back when it threatened to spill over his shoulder. “You can stop trying to disappear, Mr. Invisible, he’s in the back room now,” Sloane said, returning to the cash register and throwing him a look that was half-sympathetic, half-wry. “God, he ties you up in knots, doesn’t he? He sure does it to me, too.” She fanned a hand near her face. “At least you don’t go mute,” Soren shot back. He was pretty sure half their female crew or more had a crush on Lucas … and he did, too. It was mortifying. The store doors chimed, and a pair of customers came their way, chafing their hands. After they were finished ordering, and Soren had placed their double-tall mochas on the counter, he wiped off the espresso bar and glanced in Sloane’s direction. She was giving him a speculative once-over. Soren was quiet for a moment. “Well … I’m not really expecting him to be a prize,” he confessed. “After all, I’m meeting a guy I met online.” And, Soren appended in his own thoughts, he wasn’t much of a prize to offer, himself. It would work out, as long as he could meet someone like-minded. The door to the back swung open, and Lucas emerged carrying a till. Soren glanced at him, looked away, and glued himself to the bar. As usual, he would cling to it like a burr for the rest of the evening. What use was any sort of resolution when he couldn’t even force himself to interact with people that he knew? At least he was doing something different and breaking himself out of the rut he’d been living in. Sloane’s words made him question himself, though. Was it enough? It didn’t matter. It was a start. You can buy From the Inside Out at LT3, All Romance Ebooks, or Amazon. Click to follow my blog and receive the latest on the printed word (by me) via email, as well as the occasional fun and fascinating topic.